Terrorist attacks are no longer rare events and journalists should try to gain a deeper understanding of the complexities behind them, rather than repeat simplistic stereotypes. News coverage of the recent terrorist attacks in London and Manchester has been sadly familiar: cellphone videos of screaming victims; details of first responders’ hectic efforts; “Was it terrorism?” guesswork; speculation about the perpetrator. In the case of Manchester, the horror was amplified by so many of the killed and wounded being young people. Since the 2001 terrorist attacks on the United States, covering the type of violence inspired by al-Qaeda or the Islamic State (IS) has become a staple of the news media’s repertoire. Collectively, this reporting increases the public’s sense of vulnerability: An evil is out there, unpredictable and ferocious, sure to strike again. But what’s behind that evil? When I watch or read mainstream news coverage of the attacks, they tend to treat them as distinct events, much like a train wreck or bank robbery. 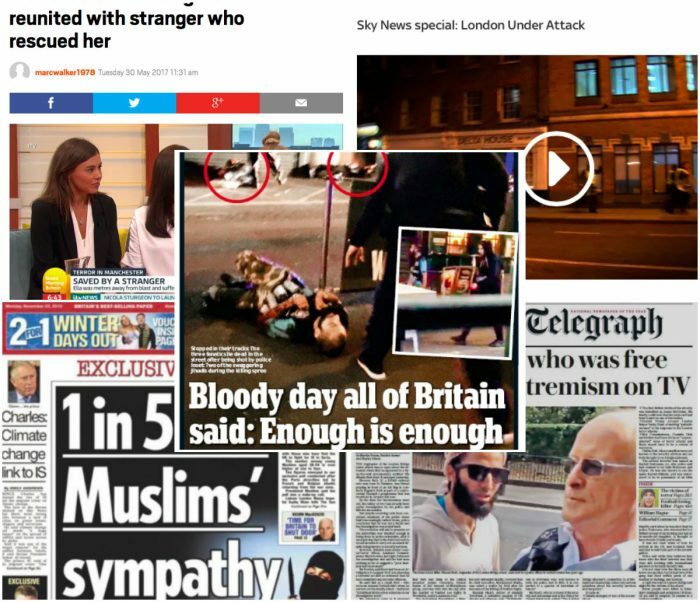 As I worked on my forthcoming book, “As Terrorism Evolves: Media, Religion, and Governance,” it became clear that for all the breathless headlines about IS-inspired terror attacks, many know little about the complexities of terrorism and Islam. Who are these people who murder so wantonly? Why do they do it? And, most importantly, how might such attacks be stopped? Answering such questions requires daily news coverage that consists of more than depictions of scattered chaos. A holistic approach to reporting about terrorism might better explain this phenomenon that’s reshaping our lives, much as the Cold War did 50 years ago. Western reporting about IS-inspired terrorist attacks almost always, explicitly or implicitly, notes a connection to Islam. But it often ends there. Many journalists shy away from religious topics, and this creates a vacuum of public knowledge that terrorists and anti-Muslim activists and politicians can exploit. The result? A religion of 1.6 billion people is being defined in public discourse by the acts of the few who spill blood in a Manchester arena or a Baghdad marketplace. And because there is such limited understanding of Islam in the non-Muslim world – 55 percent of Americans say they know little or nothing at all about Islam – many news consumers are prone to accept the idea that “Islam-equals-terrorism.” Results of a 2015 Pew Research Center study underscored the pervasiveness of stereotypes and the tensions underlying them, with significant numbers of Americans viewing Muslims as anti-American and violent. When political figures denounce Muslims, or when there is anti-Muslim backlash following an attack, terrorist organizations chalk up a victory. Because some Muslims will inevitably see their religion as being under siege, they become susceptible to recruitment by the likes of al-Qaida and IS, who portray themselves as defenders of the religion. Following terror attacks, anti-extremism responses from Muslim communities might receive some coverage. For example, an anti-terrorism message produced in Kuwait and broadcast soon after the Manchester bombing quickly went viral on social media and received coverage from Western news media. Nonetheless, Islam usually disappears from the news until the next tragedy, even though approximately 80 percent of Muslims live outside the Arab world in countries of rising importance such as Indonesia, Pakistan and Nigeria. The global political clout of Islam is, in some ways, like that of Catholicism centuries ago. If the role of Islam in world affairs were to receive continuing coverage, perhaps news consumers would realise that there is far more to Islam than violence. And if antipathy toward Islam were to diminish, terrorists would lose a recruiting tool. That said, this coverage should also address state-sponsored extremism, most notably Saudi Arabia’s well-funded promotion of Wahabbist Muslim ideology. This fundamentalist doctrine is intrinsically separatist and lends itself to militancy. It provides a purported theological rationale for treating moderate Muslims – as well as non-Muslims – as enemies. While Western politicians are restrained in dealing with this for reasons related to oil and regional geopolitics, the news media could play a more forceful role in describing how even purported allies help terrorism take root. Journalists could also more thoroughly examine the sophistication of terrorist operations. Islamic State, for example, has deftly used social media to inspire terrorist attackers, even those with whom it has no direct contact. The perpetrators of the December 2015 terror attack in San Bernardino, California had received no training or orders from Islamic State, but they pledged allegiance to IS and launched the attack based on what they had gleaned from IS’ online content. IS has used social media to spread its message, recruit followers, train fighters and raise funds. Governments and nongovernmental groups have recently become more adept at pushing back against this – the US State Department has released over 300 YouTube videos to counter the messaging of extremist groups – but the news media still tend to understate the organisational and military capabilities of terrorist groups. Consider the long-running story of efforts to liberate Mosul, Iraq’s second-largest city, which Islamic State has held since 2014. Iraqi and American sources provide vaguely optimistic updates, which are duly reported. But this battle has been underway since October 2016. Despite the US-backed onslaught, parts of Mosul remain under Islamic State control. What does this portend for future Islamic State military efforts and its far-ranging terrorist attacks? Relying on daily combat bulletins obscures the long-term realities that journalists should be analysing. More broadly, counterterrorism efforts by the United States and other countries deserve greater scrutiny. The public needs to know what’s working and what isn’t. Defeating terrorism will require a mix of hard and soft power. Shutting down terrorists’ recruiting pipelines is crucial. That requires innovative programs to reach those who are vulnerable to extremist appeals. Terrorism is a pervasive enough part of our lives to merit more consistent news coverage, and journalists on the terrorism beat must develop expertise about this multidimensional topic. (Among the best are Joby Warrick of The Washington Post and Rukmini Callimachi of The New York Times.) But overall, terrorism-related journalism remains episodic and simplistic. Since the rude awakening of 9/11, journalism, in my view, hasn’t kept pace with the bloody growth of terrorism. It needs to catch up. This is an updated version of an article originally published on The Conversation.